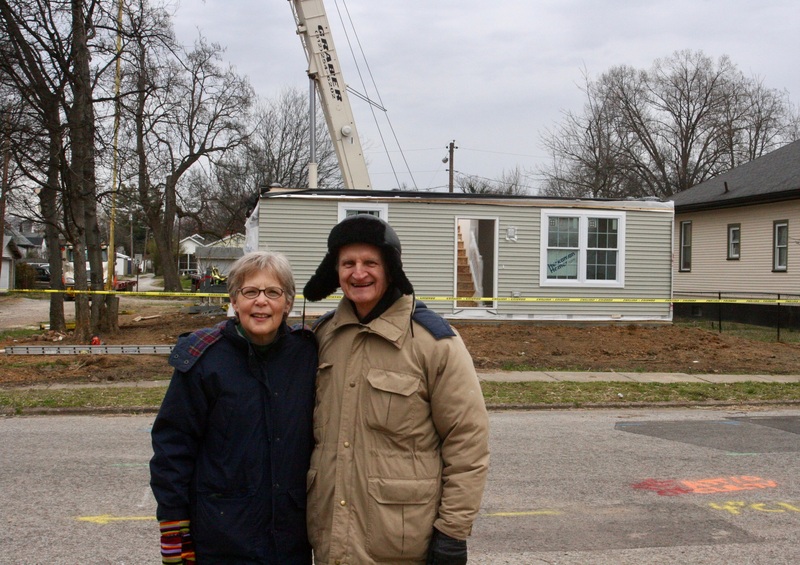 Neighbors watched in the drizzling rain as the 80-foot-tall crane lifted the four modules of the new home of Orest and Susan Holovaty one by one and set them in place. 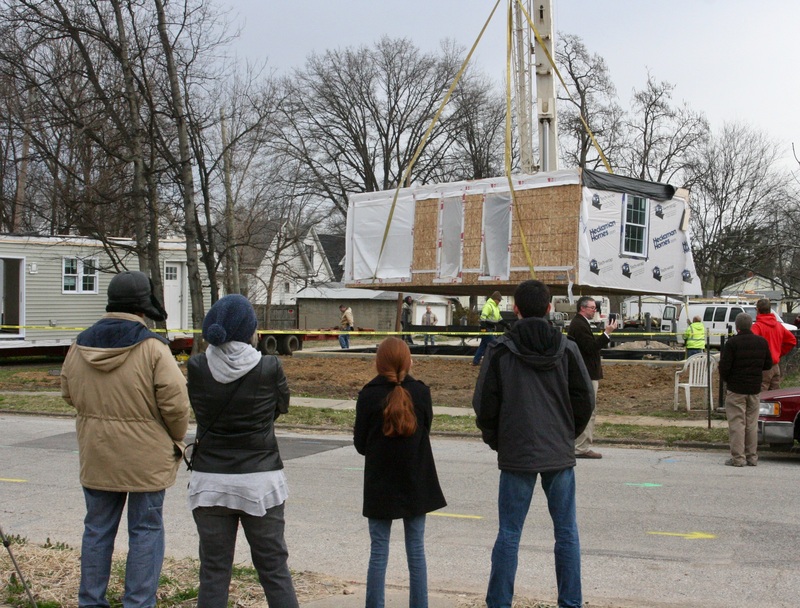 On March 23 in a drizzling rain, community members gathered on the sidewalk with cups of coffee and cinnamon rolls to watch the raising of the first new modular house in the Evansville new start. It took about five hours. Around 8:00 a.m. a crew arrived from Heckaman homes in Nappanee, Indiana, to unload the four modules, built in the Heckaman factory, that would make up the two-story, 1,800-square-foot home. 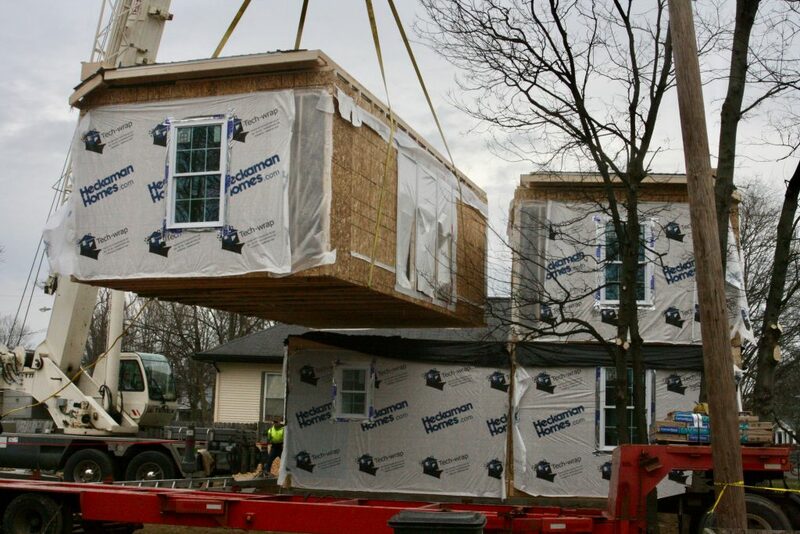 An 80-foot crane lifted the two first-floor modules and set them in place on the foundation, then the second-floor went on, and finally crew members raised the roof, which had arrived flat, attached on its outer edges to the second-floor modules. Orest and Susan Holovaty, who moved from South Bend in August, 2016, own the house and plan to move in later this spring. The house went up with all the speed and efficiency of an Amish barn raising, but planning had taken many months. Linwood Construction, a company started by Paul Hommes and John Earhart, was the builder. 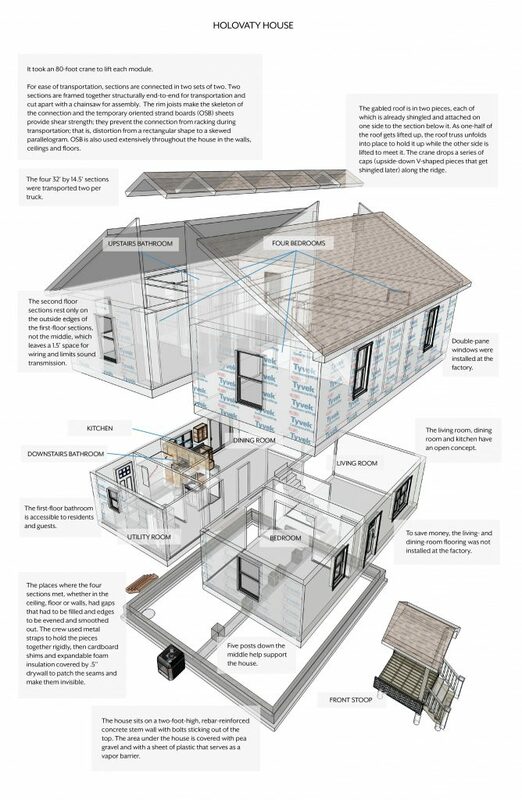 Paul is a mechanical engineer by training who has studied the costs and benefits of traditional houses (built on site) as well as two types of houses built off-site: manufactured and modular. 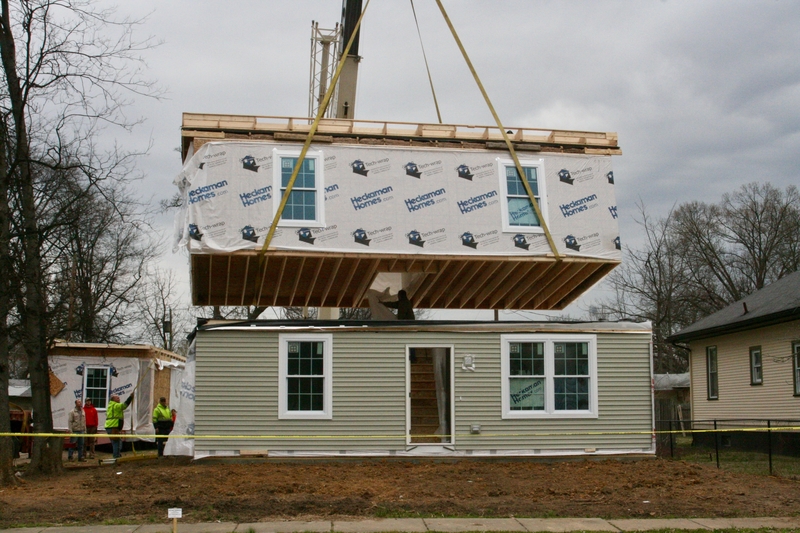 “As we looked at the type of houses we wanted to build in Evansville, we saw a number of advantages to modular houses, which are made in sections. The construction is flexible, so that you can add a second story or adapt the floor plan to have a door on the short end. The modules, constructed on wood frames in a factory with all the wiring, plumbing, flooring and appliances already in place, can be quickly stacked and arranged in a variety of ways, and they are less expensive than a site-built house.” The community has built both traditional and manufactured houses in Allendale, but this is the first use of modular housing in a new start. In February, when the time came for breaking ground, two experts had arrived: Gerry Orthmann (Yakima) and Chris Taylor (Corvallis). Both are retired carpenters and contractors with 90 years of experience between them. Gerry and Chris have helped with other projects in Evansville, Indianapolis and Allendale, but this time they wanted to do more than lend a hand. “We wanted to share what we know with others, so many more people can help build cities for the Lord,” Chris said. 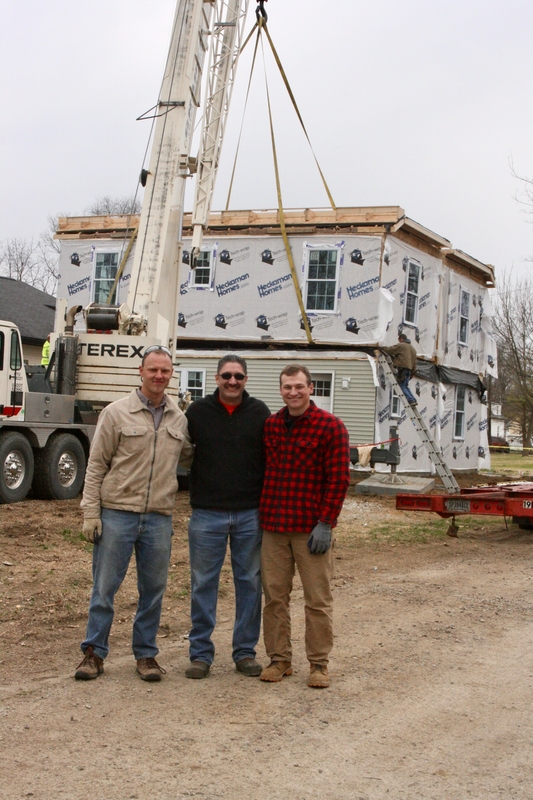 Paul Hommes (left), president of Linwood Construction, and John Earhart (right), Linwood’s business manager, took a moment with Scott Syers of Heckaman Homes, the manufacturer of the modules. To that end, Chris and Gerry spent eight days teaching Paul, John and four other brothers from Indianapolis, Allendale and Evansville how to dig and pour a foundation. After Chris and Gerry completed the foundation for the Holovatys’ house, teaching as they went along, they supervised as the six younger men built the foundation for a second house by themselves. 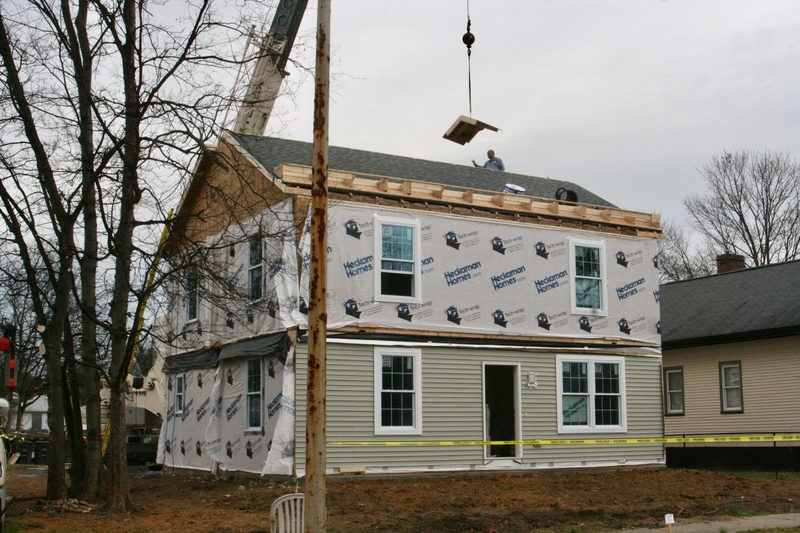 The second house will be for the missionary sisters, with modules scheduled to arrive on May 9. 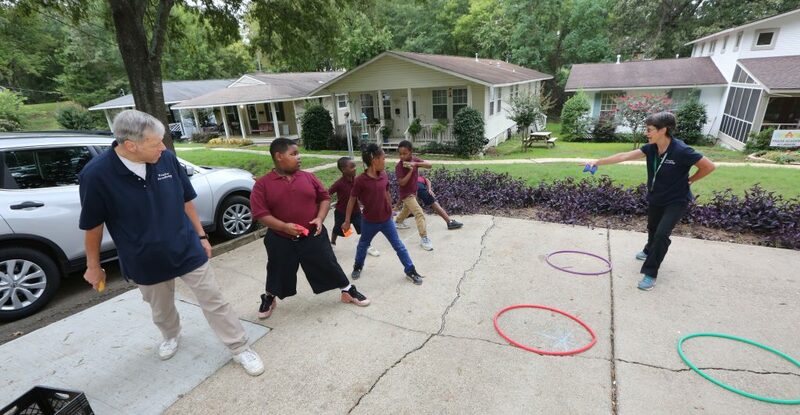 “We saved thousands of dollars by having their assistance,” Orest added. The day before the house was set in place, an advance team from Heckaman had come to map out the exact delivery route for the modules, which would arrive on two trucks with 65-foot beds. For ease of construction and transportation, modules are connected in pairs by sheets of oriented strand board, so before the crane could lift the modules a crew member used a chainsaw to separate them. The gabled roof came in two pieces, each of which was already shingled and attached on one side to one of the second-story modules. As the first half of the roof was lifted up from the module below, the roof truss unfolded to hold it up while the other side of the roof was lifted to meet it. The crane dropped a series of triangular cap pieces along the ridge, and then the basic structure of the house was complete. A few days later, a crew arrived from Heckaman to make the house livable. They finished the exterior, siding and shingling the parts that could only be worked on after the house had been set in place. On the inside, as typically happens when the modules travel, their frames had shifted a bit, creating cracks in the drywall near windows. Those needed to be patched. The exterior door frames and interior doorways had also gone askew in the move. Various gaps had to be filled and edges needed smoothing. The Holovatys saved money by installing their own stove, refrigerator and living room flooring and by painting the interior walls, which had been primed at the factory. Linwood Construction arranged for licensed electricians to connect the house to the local electric utility, and a plumber to connect to local water, gas and sewer lines. An HVAC contractor installed the furnace, air-conditioning equipment and some ductwork. great work Paul and all... good to see you using all the skills I taught you !